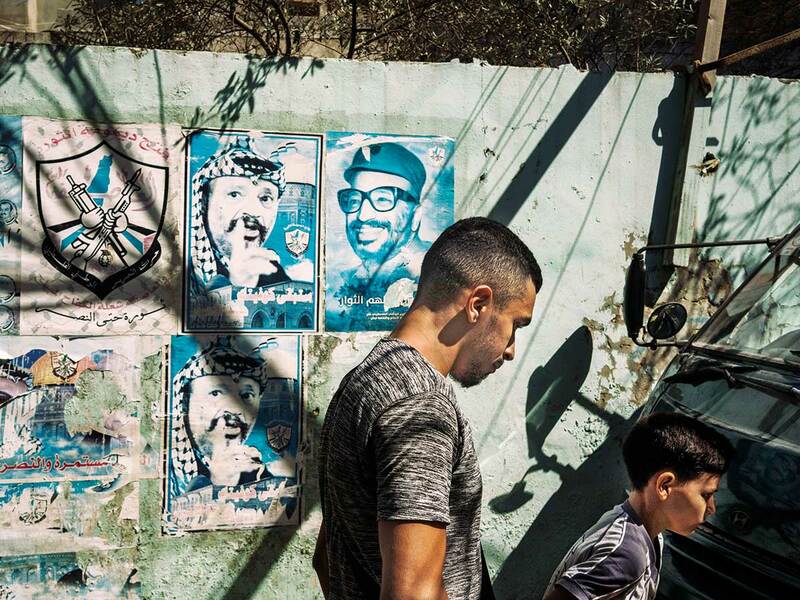 Bourj Al Barajneh Refugee Camp, Lebanon: The do-it-yourself tattoo on Jihad Al Qassim’s arm shows a faded outline of occupied Jerusalem’s Al Aqsa Mosque, a brand from decades ago signifying a teenage hope to return to the land his family fled. But now, at age 49, his yearning is to get out and go anywhere. “We are suffocating,” he said. Over 70 years, this half square mile of canvas tents erected by Palestinian refugees who fled the fighting when Israel was created in 1948 has grown into a densely packed neighbourhood of at least 50,000 people. Despite the fact that many were born and raised in here in Lebanon, Palestinian residents remain reliant on the United Nations Relief and Works Agency for Palestinian Refugees in the Near East (UNRWA), an entity that provides aid to millions of Palestinians around the region, particularly for basic services like health care and education. Now, however, the Trump administration is trying to dismantle that lifeline, leaving many Palestinians fearing for their futures. In a statement last summer announcing its decision to halt funding, US State Department officials described UNRWA as “irredeemably flawed”,echoing the Israeli sentiment that the agency perpetuates the refugee problem, rather than solving it, and allows the countries that host them to shirk their responsibilities in resettling them. The move placed increased scrutiny on UNRWA, which has struggled to raise the $1.2b it needs annually to serve a population it estimates has grown from 700,000 to 5.5 million - with some Palestinians even acknowledging that the time has come to hold the agency to account. At the same time, the United States has also tied the matter of UNRWA reform to a much wider aim: taking off the bargaining table Palestinians’ “right of return,” one of three key issues integral to the Middle East peace process. These efforts have sparked debate over what it means to be a Palestinian refugee and highlighted questions on resettlement, and whether residency or citizenship in another country would diminish their claim to a future Palestinian state. For the United States, at the heart of the matter is how to define those like Qassim, who has only ever known Lebanon as home, and whom UNRWA classifies as a refugee. Further complicating the matter, US Ambassador to the United Nations Nikki Haley claimed that if the UNRWA adjusts its refugee numbers, the Trump administration may consider returning its funding. Yet, erasing the right of return in the context of the Israeli-Arab conflict is unlikely to prove as simple as rearranging the agency’s head count, and US efforts to financially squeeze UNRWA appear to be failing. Last week, the agency announced it had almost closed the funding gap triggered by the cut in US aid, with more than 40 other countries increasing their contributions this year. Qassim and his family live in a spartan, leaky two-room apartment, tucked into a jumble of alleyways tangled with electric lines, pipes and Internet cables. But Lebanon is a perpetual limbo for the Palestinians here. We were born here. We know Lebanon more than Palestine. We don’t know Palestine... But in my heart, I’d always be Palestinian. He can’t find work. His sisters want to study at university, but he can’t afford to send them. He describes his daily routine as “coffee, cigarettes, coffee, cigarettes.” By doing odd jobs, he has saved $430 of the $1,200 he needs to buy a scooter, which he hopes could secure him a job as a delivery driver. Unable to return to their ancestral homes, the refugees are also unwelcome in Lebanon, where they are legally banned from more than 30 vocations as well as from owning property. Camps have become a magnet for drugs, crime and extremism, with security left to their own committees, rather than the state. UNRWA had been slowly reducing services long before Washington - previously its largest single donor - slashed $360 million in annual funding. “It’s much better to leave to get a future,” Qassim said. The Trump administration is conflating two issues, said Daniel Kurtzer, the former US ambassador to Israel and Egypt and a professor of Middle East policy studies at Princeton University. “What the Trump administration is doing, in one sense, is long overdue, which is to hold up a mirror to the international community and say: Is this what you really intended?” he said, citing the millions of dollars the international community pays to support an ever-growing population. Don’t ask me how many Palestinians are in the country, because the answer is: I don’t know. However, Kurtzer said the way the administration went about addressing issues with the agency was “ham-handed” by tying it to the broader question of refugee status, a separate issue that should be settled in negotiations. Even if UNRWA is eliminated, Palestinians will continue to assert that the United Nations has endorsed their right of return, as well as the Palestinian leadership that will negotiate on that basis, he said. Palestinian officials have called the cuts cruel and vindictive, saying that together with the decision to recognise Jerusalem as Israel’s capital, it is an attempt by the United States to unilaterally impose a solution before a plan was ever unveiled. UNRWA strongly disputes the U.S. assertion that it is an irredeemably flawed operation, but accepts that its numbers may be off. “Don’t ask me how many Palestinians are in the country, because the answer is: I don’t know,” said Claudio Cordone, director of UNRWA affairs in Lebanon. The agency said it has registered 450,000 Palestinians in Lebanon but has no way of knowing how many of those have left the country. UNRWA provides services to fewer than half the registrants, about 204,000 people, Cordone said. A survey conducted under the guidance of the Lebanese government and published this year, which counted residents of the country’s refugee camps and 156 other areas where Palestinians live, put the number at just over 174,000. Dozens of the young men in Bourj Al Barajneh’s coffee shops are doing what they can to no longer count among them. Many have risked the perilous sea journey to Europe, joining the wave of Syrians fleeing violence in their war-torn country. As smuggling routes have become more difficult, Palestinians have also turned to fake and stolen travel documents. About $10,000 to $12,000 buys a stolen passport - a potential free pass to Europe. Even easier, Palestinians with the means can book a flight with a transit stop in Spain, allowing them to seek asylum at the airport. Last year, Palestinian asylum claims in Spain jumped from 355 to 1,165. Those who rely on UNRWA fear that US funding cuts may bring about its demise. The Qassim family fears this more than most, as Jihad works as a guard in a UNRWA-managed school, where he takes home $1,000 a month. Everyone is anxious that their livelihoods may soon disappear, he said. For the stateless, the agency is more than an employer and aid provider. Jordan, home to 40 per cent of the Palestinian refugees registered with UNRWA, is particularly vulnerable. Jordan suffers from high debt and unemployment, and large street protests earlier this year resulted in the prime minister’s ouster. Jordanian officials fear the elimination of UNRWA’s services could provoke a new crisis. They have rebuffed US offers of direct funding instead of working through the agency, UNRWA officials say. Jordan has also led sideline efforts at the United Nations to raise alternative funds for UNRWA, announcing $118 million in additional funding two months ago from countries including Germany, Sweden and Japan. Though some Palestinians have become Lebanese citizens over the years, Lebanese officials vehemently oppose letting them integrate into society at large. The refugees are still widely blamed for Lebanon’s 15-year civil war, which ended nearly three decades ago, and many Lebanese are afraid that the Palestinians could upend the delicate political balance among the country’s religious groups. Ultimately, Lebanese officials say, the only solution is for the refugees to go home. In Gaza, protests regarding the cuts UNRWA has already made have forced some of its international staff to leave. Manal Kortam, a Palestinian political activist in Lebanon, agreed that abolishing UNRWA could be a good thing - though for very different reasons. “UNRWA is a source of dependency,” she said, and the agency’s creation allowed Arab countries to shirk their responsibility to refugee populations and led to Palestinians becoming marginalised. In Lebanese elections this year, Kortam ran a mock campaign to highlight Palestinians’ lack of political rights in the country. Nostalgia for Palestine incubated in the camps is not enough, she said. It is those who emigrate to Europe and gain political rights there who are more able to engage in activism. “Palestinian leaders want to preserve the camps, and they say camps are the sign of return but none of their kids nor (they) are in camps,” she said.